This hose is rated at 75 psi and is used for discharge or delivery of dry bulk food products. The tube is made from 3/16" white NR which is abrasion resistant and meets FDA requirements. 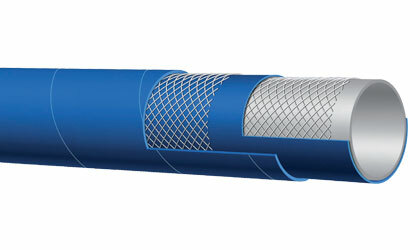 The hose is reinforced using spiraled high tensile textile cords with static wire. The cover is made from blue SBR/EPDM which provides abrasion and ozone resistance. T760LE is available in a 4" ID size. Click here for more info.